The twentieth century opened with the Boxer siege of the legation quarter in Peking. So-called after a flowery translation of their movement as the ‘Society of Harmonious Fists ’, the Boxers were intent on driving foreigners out of China. They had been spreading their attacks over North China throughout the early months of 1900 but the legations in Peking were slow to grasp that the attacks might turn upon them. Extra forces, including British marines, were eventually summoned from Tientsin and arrived on 31 May 1900. 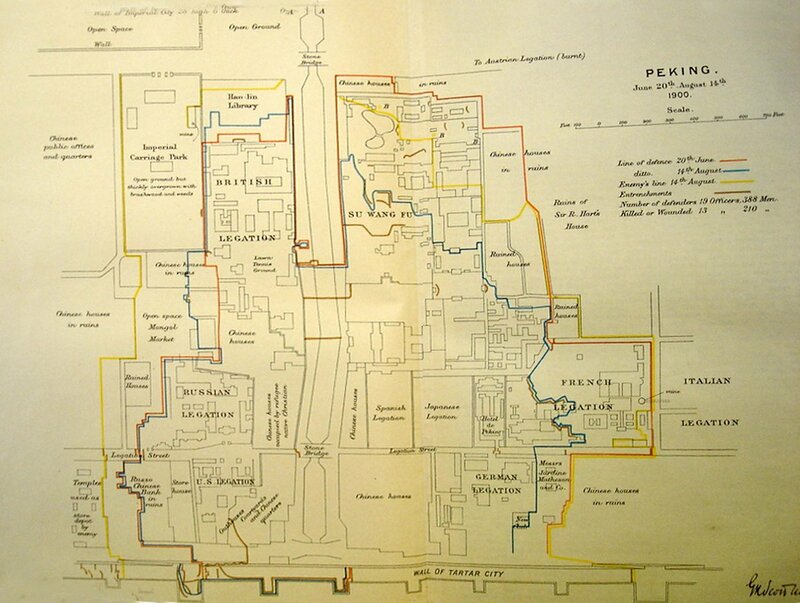 Missionaries fled from the countryside into Peking, which was effectively sealed off from contact with the outside world on 10 June. Legation guards and the new troops began to clear lines of fire around the legation area in case of attack. On 19 June, the Chinese authorities declared a state of war and offered foreigners a safe passage to Tientsin the following day: few took up the offer. An ultimatum ran out at 4 p.m. on 20 June, at which time firing on the legations started and the siege began. It was to last for 55 days. At the beginning of the siege, the legations’ line of defence enclosed an area of about 70 acres with the canal dividing it roughly into two halves. The British compound was in the north-west of this area, the Russian and American legations in the south-west, the German and French legations in the south-east, and the Suwangfu palace in the north-east, The massive walls round the seven acres of the British compound, and the compound’s fresh water wells, gave it the best defence of any legation. The eleven resident ministers decided that the British compound, as the safest haven, would be the fallback for a last stand should one be needed. All foreign women and children were gathered there at the beginning of the siege, and missionaries and the foreign staff of the Chinese Imperial Maritime Customs retreated there soon afterwards. As a result, there were about 500 Westerners, including about 75 troops, over 350 Chinese and over 200 horses and mules in the British compound for most of the siege. In the outer legations there were about 400 troops, 400 Chinese servants and about 2,700 Chinese Christians. There was a crisis early on in the siege when it looked as though all of these might need to retreat into the British compound, but the danger passed. 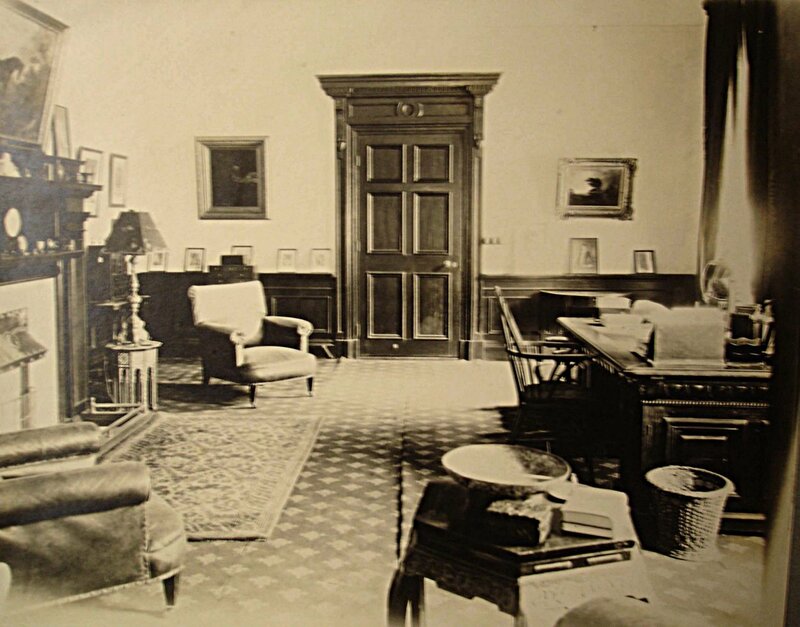 The chancery building was used as the hospital for the whole quarter, with its reading room as the operating theatre, and the residence as nursing wards. The siege was relieved on 14 August by an international expeditionary force. By that time, the defenders had had to concede about 30 of their acres, mostly around the eastern edges: most of the ceded and surrounding areas were in ruins. The British compound fared much better although almost every building had been damaged by shot or shell, many of the trees had gone, the horses eaten, and the grounds dug up for filling sandbags, excavating shelters and making a burial ground. 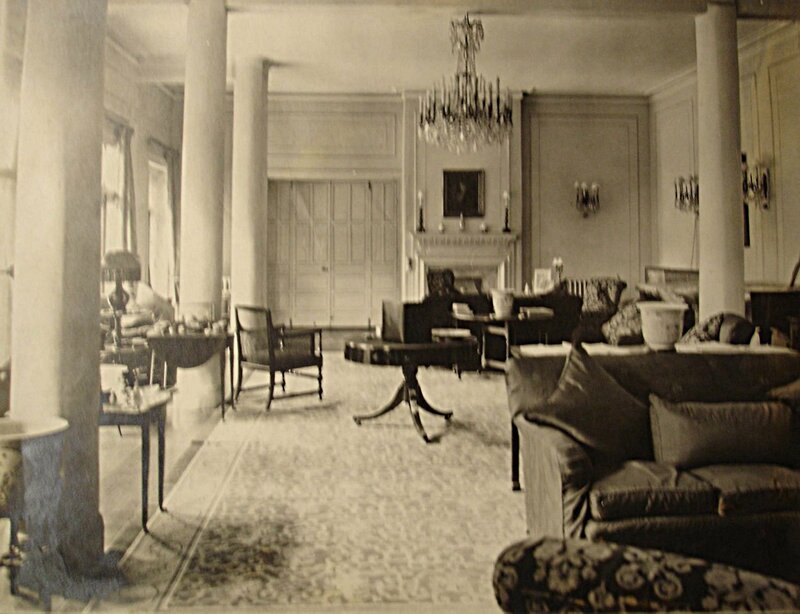 Much of the furniture had been destroyed, and ‘the window Curtains in Minister’s house and silk for Drawing room walls had to be cut up for sandbags’. The casualties were borne by the troops: 13 of their 19 officers and about half of their 400 or so men were killed or wounded. The death toll of civilians in the British compound was fewer than ten, including four consular officers. The trials, recriminations, farces, heroics and moods of over 800 people of different nationalities and callings crowded into seven acres for eight weeks under spasmodic fire and continuous risk are widely and contradictorily chronicled. A Royal Engineer shed a sarcastic sidelight on the efforts of one individual: ‘There were no engineers, military or civil, among the garrison of the British Legation. 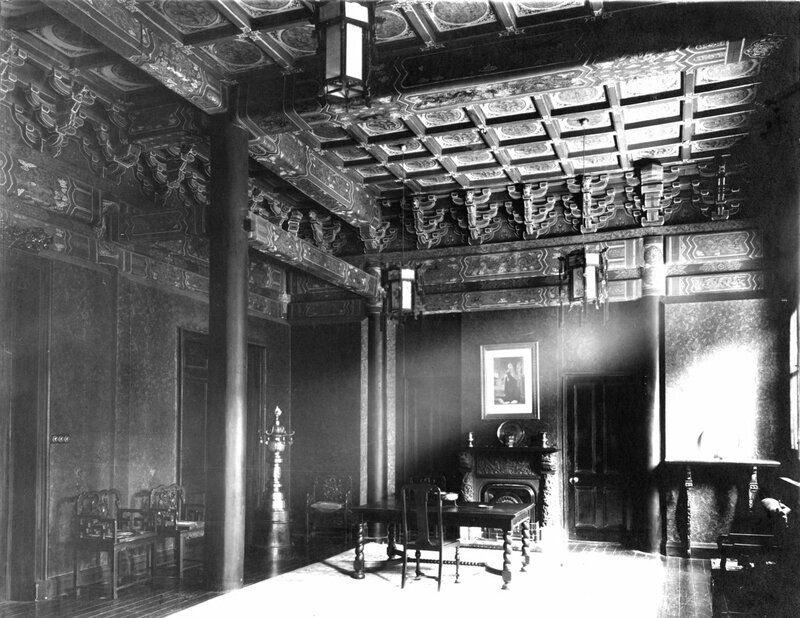 There was, it is true, an architect and surveyor … but it is said that … he confined himself … to writing down damages and dilapidations.’ William Cowan, the traduced Office of Works architect in question, was stranded at the legation while making what he expected to be a short duty visit from Shanghai. He gave a fuller account, albeit rather a vague one, of his contribution during the siege to the Secretary of the Office of Works after he managed to get back to Shanghai in mid-September: ‘I acted night and day as a Volunteer in defence of the Legation, and I also afforded Sir Claude MacDonald [the British minister] my professional services when called on’. Once the siege was over, the legations determined that there would be no repetition in the future. They set about enlarging their compounds, and the legation quarter, by commandeering the surrounding areas of ruined Chinese offices, shops and houses. They then built a wall with gatehouses around the whole new legation quarter, and administered it much as if it was a Concession area. Under the 1901 protocol that settled future arrangements, including compensation for the damage sustained, legations were able to bring in many more of their own troops. They built quarters for them on their recently grabbed land, for which they paid nothing, and they stopped paying the rent for their original legation areas. 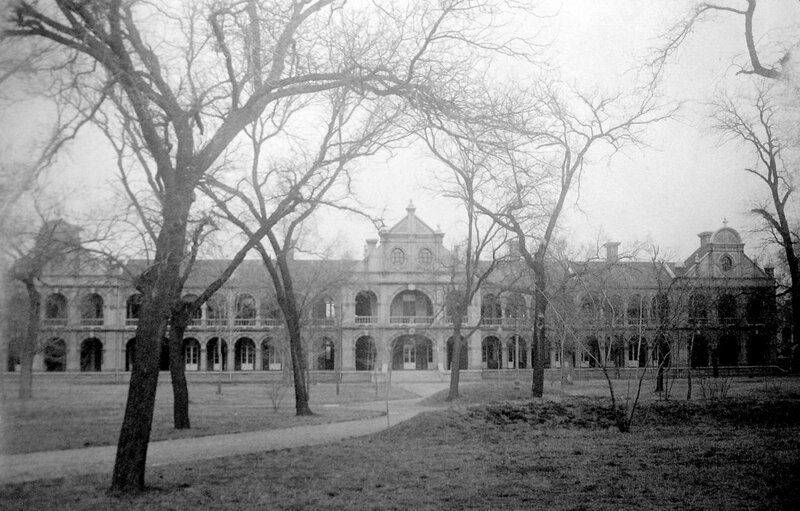 Hence, in 1901, the areas formerly occupied by the Hanlin academy (which the Boxers had set alight during the siege), the Imperial Coach Park, the Mongol market and former important Chinese offices were brought within the British compound’s perimeter, increasing its size from about seven to about forty acres. The original compound, referred to as the civil area, was extended northwards, a large military area was created to its north-west, and a recreation ground to its south-west. 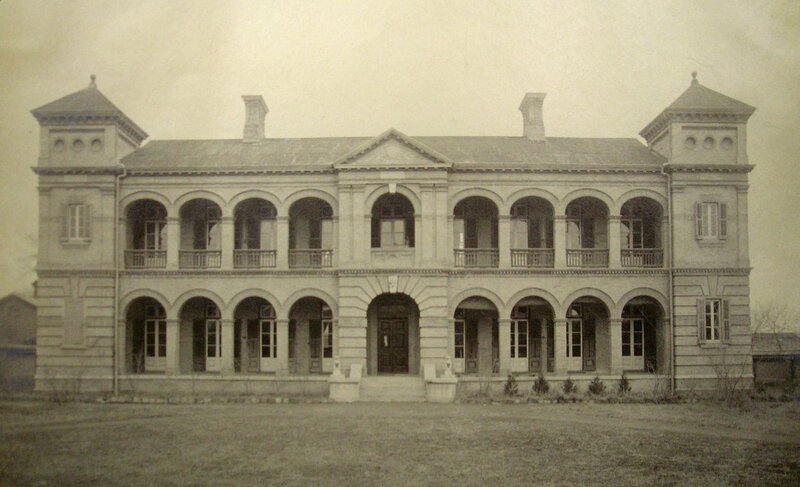 All the damaged buildings were made good soon after 1901 under Cowan’s supervision, thanks to the Treasury agreeing a special grant of £5,000 pending receipt of compensation monies from the Chinese. The War Office built barracks, potentially for up to 500 troops, on the new military ground. Their commandant wanted to build his own house on the site of the Hanlin academy, now part of the civil area, but the diplomats had their eyes on this site as an extension to the minister’s garden. The commandant retreated to a site at the western end of the recreation ground, where a house for him was completed in 1906. 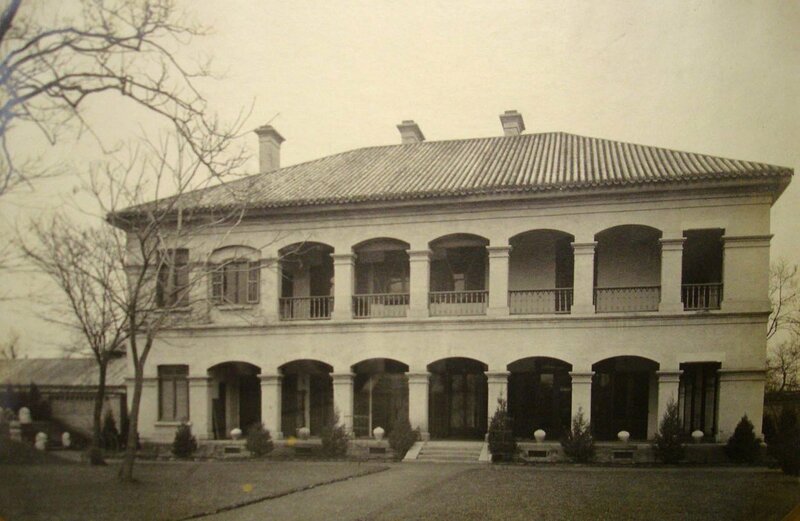 Two new houses, for the Chinese secretary and the commercial attaché, were built in 1913-15 on a strip of land sliced off the military area adjoining the civil area. At the same time, a new sanitation system was installed throughout the compound. New students’ quarters and stableyards were built on the site of the Imperial Coach Park. The stableyards were converted to garages in 1926 and, in the same year, the legation contributed to the covering of the canal. 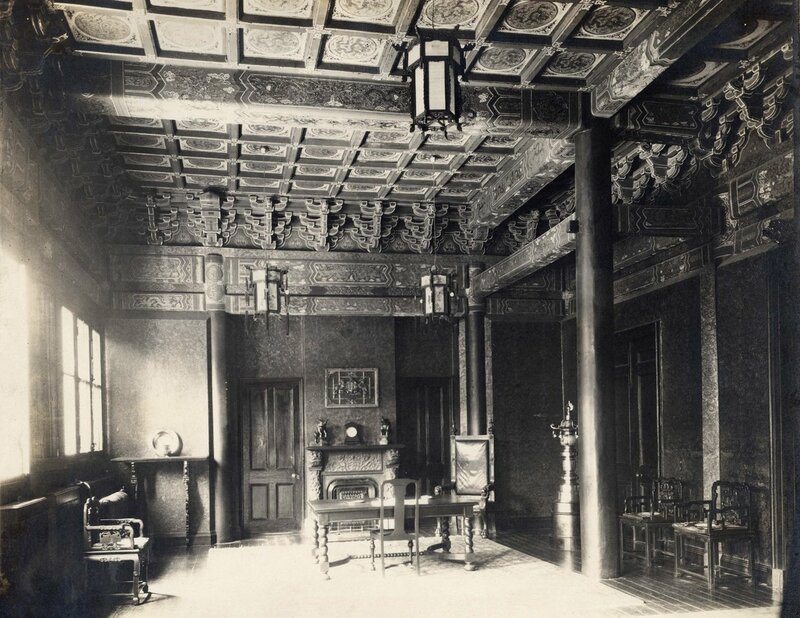 The civil compound saw little other physical development over the next three decades, while Peking legation life continued, with interruptions, its frenetic and introverted way until the mid-1930s. 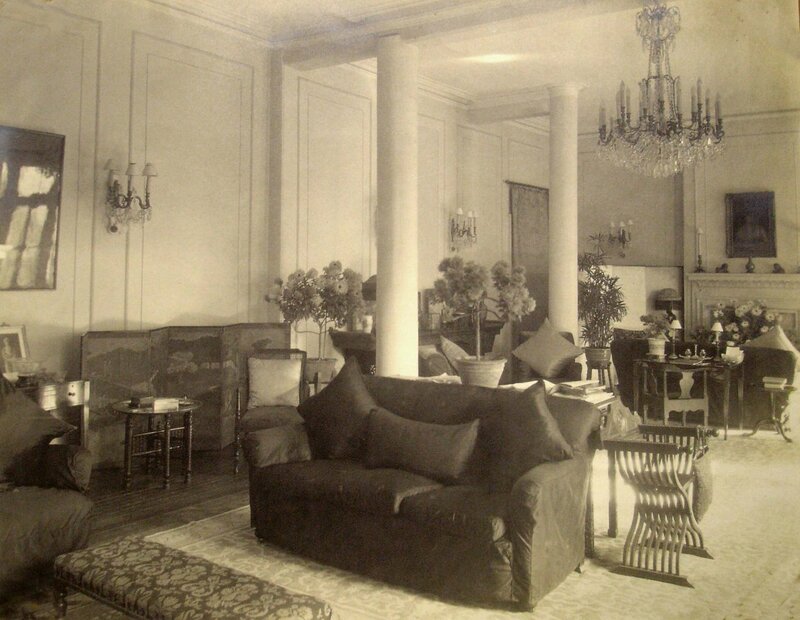 The legation became an embassy in 1935. 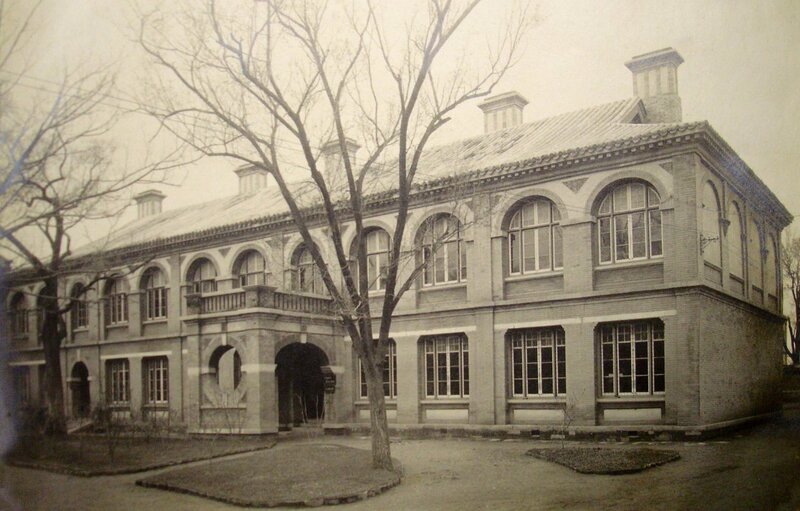 Much of it moved in 1936 to the Nationalists’ capital at Nanking, leaving a consulate-general at Peking. Some of the accommodation on the compound was sub-let to normally unentitled civil servants and some resident businessmen. 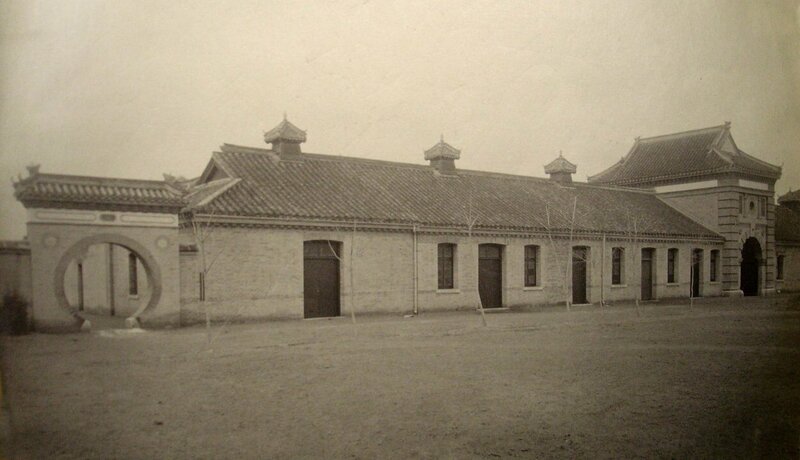 The Japanese occupied Peking in 1937 and the compound filled up again with people seeking protection. 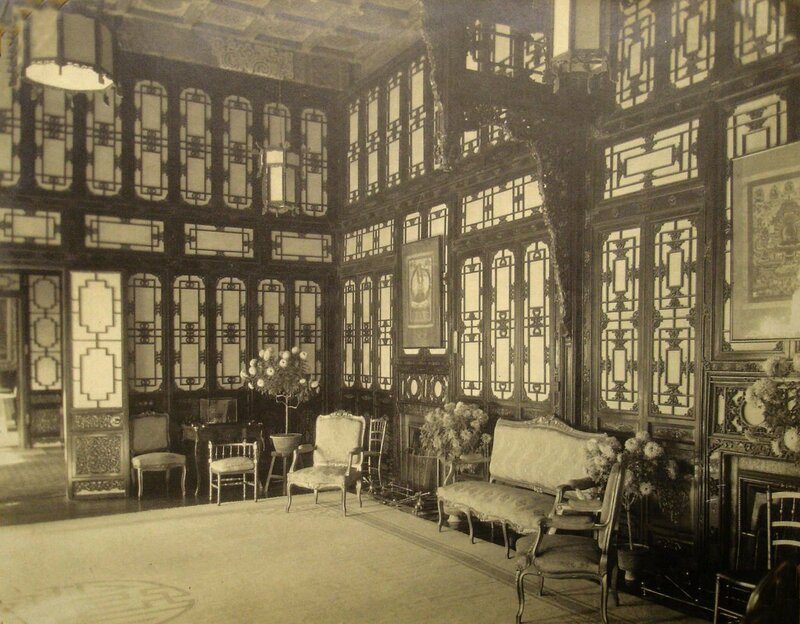 After Pearl Harbor, all British diplomatic and consular staff were interned by the Japanese, but in Peking the consulate-general staff were allowed to remain in their homes until repatriated via Shanghai in summer 1942. It had been agreed with the protecting power, Switzerland, that any British civilians remaining in Peking could then go and live on the compound, and apparently there were fourteen of them doing so when the war ended in September 1945. Consulate-general staff returning to the compound after the war found that it had been well looked after by caretakers, under the eye of the Swiss. Surplus space in the compound was let out in the late-1940s to the British Council, Royal Air Force language students, a company of United States marines and others. The Ministry of Works was assiduous in ensuring that rent was collected. The People’s Liberation Army captured Peking in January 1949 and the communist People’s Republic of China was proclaimed in October 1949. Britain recognised the new republic in January 1950 but the expected subsequent establishment of normal diplomatic relations did not follow. 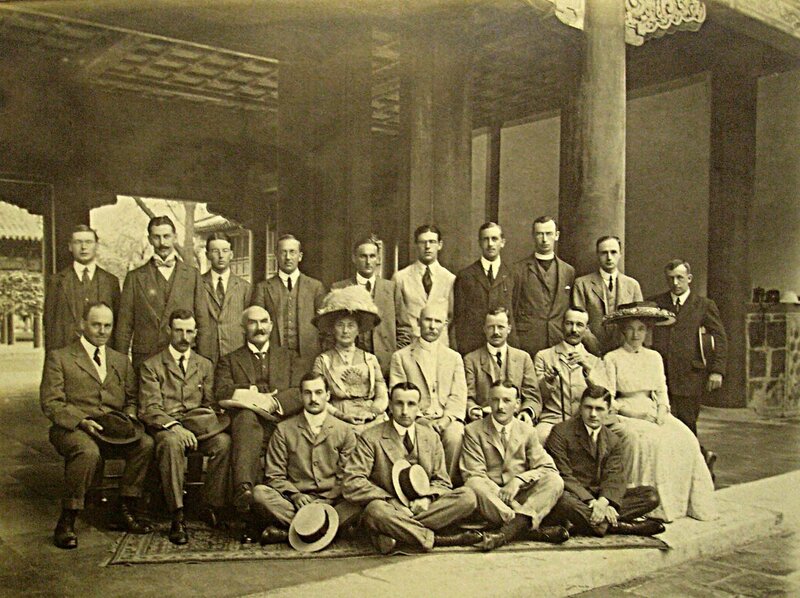 The Chinese determined to treat the British officials in China as negotiating agents and not as an embassy. 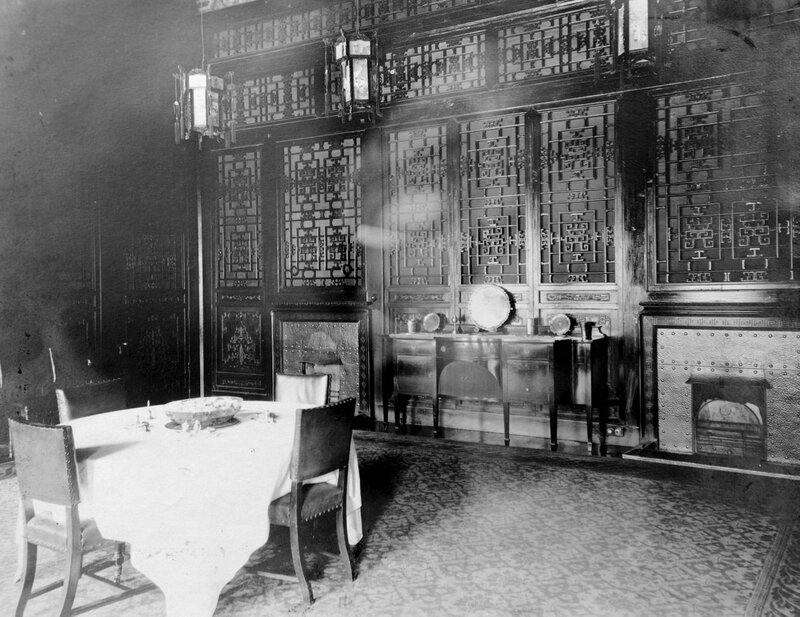 The British staff therefore returned to Peking from Nanking in February 1950 under a chargé d’affaires and not an ambassador. 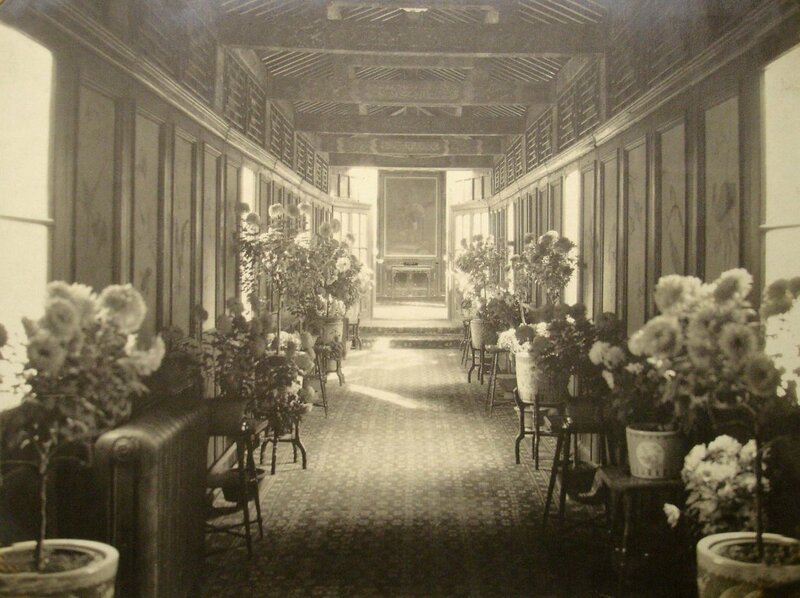 The residence was no longer in good condition and the chargé and his successors preferred to live in one of the newer houses, and parts of the residence were soon converted into junior staff flats. Legation staff group, c 1910. 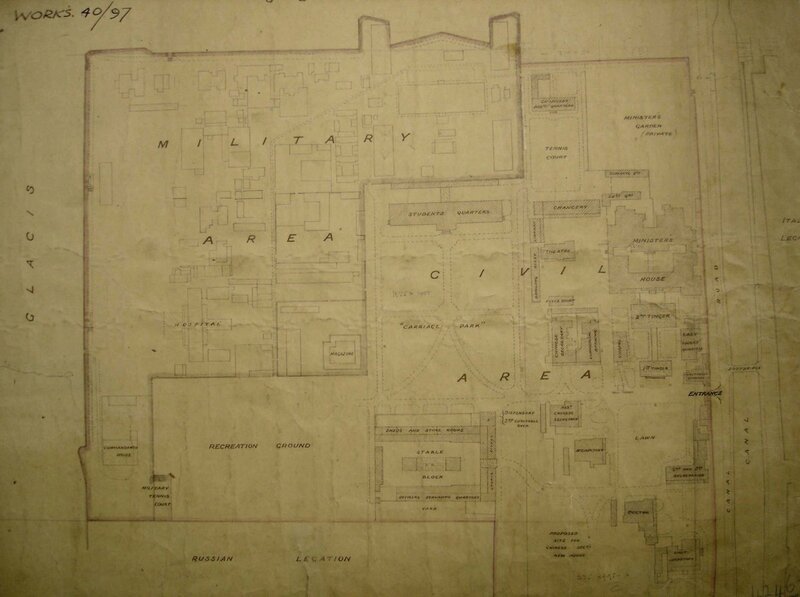 1906 plan of the compound, greatly enlarged to the north-west by the military area with barracks and hospital, and to the south-west by the recreation ground. A new park in the centre belonged to the civil area. 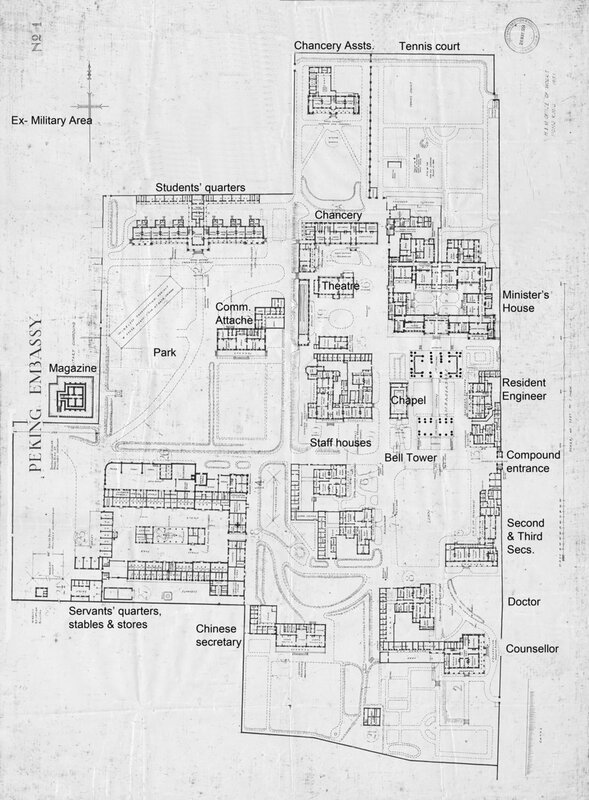 Plan of the civil area after the construction of new post-siege buildings. 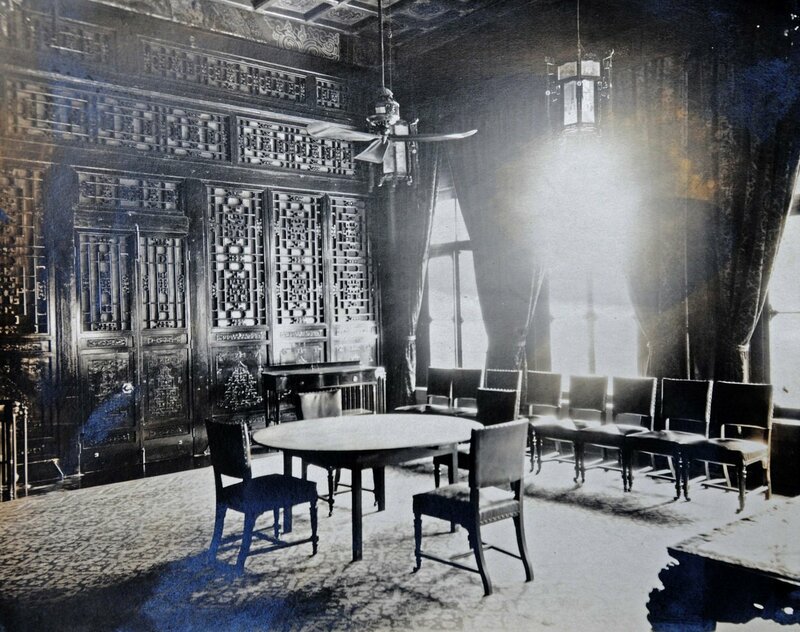 Minister’s residence: hall, c 1895?